What's it about? When savages kidnap a woman (Lili Simmons) and deputy from a frontier town, a posse consisting of gruff sheriff (Kurt Russell and his moustache), grizzled old-timer (Richard Jenkins), dandy sharpshooter (Matthew Fox) and the woman's crippled husband (Patrick Wilson) set off in pursuit. Is it any good? Perhaps best if you watch this without knowing too much about it. Go on, I'll wait here eating beans by the campfire til you return. Back again? Wait, you just hid behind that cactus, didn't you? Well, we'll keep spoilers to a minimum here. Suffice to say that it's clearly camped in traditional Western genre for most of its running time, before it veers off the trail into a different type of territory near the end. But I liked it a lot. It moves quite slowly, but that allows us to enjoy the interesting interactions between the main characters, facilitated by some eloquent dialogue which is often wryly funny and, towards the end, quite moving. The performances are all good and by the end I really did care who lived or died. And make no mistake; people do die! The violence, when it happens, is rather matter-of-fact and all the more shocking for that, with some particularly nasty injuries accrued on the way to the climax. It may have a gentle pace, but this is not for the faint-hearted. 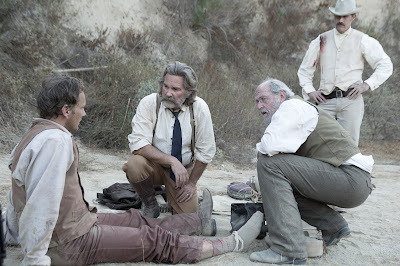 And yes, a bone tomahawk does make an appearance, to memorable, cover-your-eyes effect. Recommended. (The film, that is, not the bone tomahawk antics). I don't trust you. What do others think? Some misgivings from those who felt it didn't quite pull off its switch in tone towards the end, but generally critics were impressed that it had manged to pay homage to the character-driven Westerns of John Ford (The Searchers in particular), whilst also skewering some romantic Wild West myths. "This is why frontier life is so difficult," says one character. "Not because of the Indians, or the elements, but because of the idiots." With smart writing like that, which has invited comparison with Tarantino, it's apt that good word-of-mouth is starting to build it a cult following amongst normal audiences on rental services, where its unique charms can be savoured at leisure. What does the Fonz think? Oooh! I could eat a horse opera.